Love a good childhood flashback? 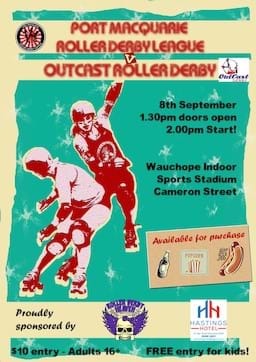 Well, roller derby is about to hit Port Macquarie! On Saturday, September 8th, The Breakwall Brawlers from Port Macquarie Roller Derby League will take on Outcast Roller Derby from the Central Coast at Wauchope Indoor Sports Stadium at 2pm. There will be delicious snacks and drinks available for you to purchase, as well a team merch! Tickets are $10 for ages 16 and up, while kids have FREE entry! P.S. Head to our Facebook page for your chance to win 2 x FREE TICKETS to the game. All you have to do to be in the running is check out the post on the Port Macquarie Roller Derby League Facebook page!